Lush tea tree toner water - Picked this up recently I've been really enjoying using it. I'm always on the look out for products recommended for oily, blemish prone skin and this seems to be helping clear up blemishes pretty well. Bourjois 10 day no chip polish in 25 - This polish is one of those annoying ones that only have a number instead of a name - so boring! Anyway I love this colour, it's a perfect summery coral. I've had it for a year or two now and I always end up reaching for it come this time of year! Sally Hansen Diamond Strength nail hardener - I've been trying to grow my nails long recently in order to be able to file them into an oval shape, and this really helps keep your nails strong. Especially as I work as a nanny, I've found this really helps prevent nail breakage when I'm running around doing various hands-on activities like arts and crafts. L'Occitane honey and lemon hand cream - I hate having dry hands and this stuff smells so good!! It also has a really unusual lid, you twist the lid and this opens up a hole in the top of the lid that you squeeze the product out of. This keeps my hands uber soft, despite having oily skin on my face my hands tend to get pretty dry 'year round. Stila smudge stick in Stingray - This is actually an empty! It ran out this month and I desperately need another one, I loove this eyeliner to death. It's super pigmented and easily smudged, while also staying put throughout the day and being waterproof. What's not to love? They also do a couple of other colours I want to collect. the Bourjois nail varnish is such a lovely colour! 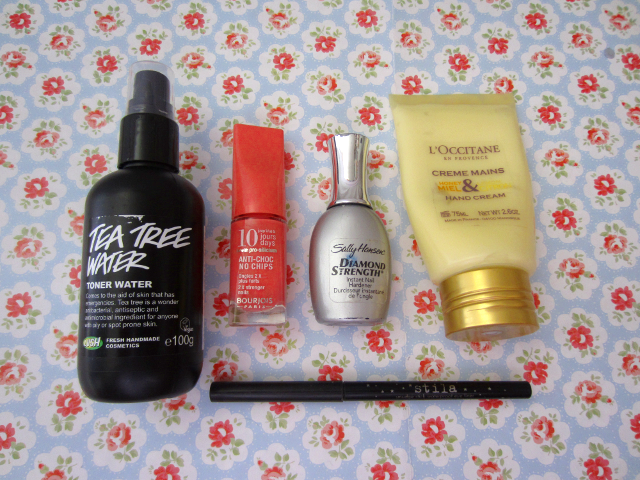 Fab favourites! I love your blog and I have followed you with Bloglovin and GFC, if you ever get a chance to check out my blog I would be delighted, thanks! I'm pretty sure I have tried that eyeliner and I liked it! I haven't yet tried the other products. Thank you so much for your comment, I do appreciate your support. I liked your point about reminding myself that it's my mind confusing how to react. I know my mind plays tricks on me all the time.